Maybe you'd like to spend the day with me here in NYC? Be warned, we're in for a lot of walking! We'll start with breakfast at The Red Flame, just along 44th St by our hotel. A short stack of pancakes should see us ok till dinner time. Mark and I are going our separate ways today and meeting Jordi later. We'll take a right turn onto 6th Ave, heading north. It's Sunday morning, just gone 10am and there's not many people around. Rather chaotic here because the preparations are being made for the lighting up ceremony next Wednesday and there are barriers all over. We'll find a way through to go and take some photos outside Anthropologie which you might have seen in the previous post. Back then, along 6th Ave, past the famous "LOVE" sign on the other side of the road. Oh, look, there's a salon with empty places offering a $10 manicure - let's drop in. It's the Russian Tea Rooms and the Carnegie Hall. They're just putting up the trimmings and there's a bit of shouting going on. We'll go into Starbucks next door and enjoy a tall Peppermint White Chocolate Mocha - skinny and extra hot please. Then into Kates for ribbons and stickers and fancy papers and some crafty ideas. Time to move along, east on 57th, past these spectacularly huge candy canes adorning another office block, taking photos of Bergdorf Goodman windows and heading over to Madison Avenue. Rats! 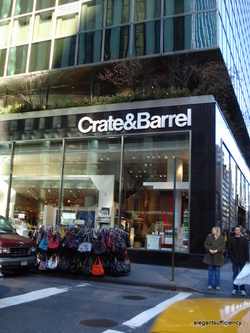 Crate and Barrel don't open till noon, so we'll hop on a bus and head up the East side towards the Whitney Art Gallery. Sorry, no time for art, but I know there's a loo there! The residents of these streets like to plant ornamental cabbages. Hmmm. 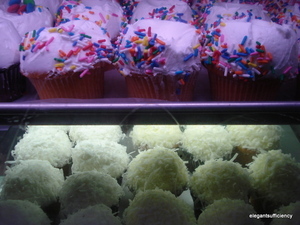 Looks like an interesting shop across the street "Birthdaybakers, Partymakers". As we go we can imagine what it would be like to have an apartment high up there overlooking the Upper East Side on a clear morning like this. The views must be spectacular. There are a lot of high-end stores along this part of Madison, including this jeweller, whose window trimmings are gorgeous. Shall we try a sample of their sea salt caramels? We can console ourselves that life would be rather more expensive if we could shop here everyday. Back onto 5th Ave, by the Plaza and isn't that a bunch of knitting on that van which just drove past? A few more people at the Rockefeller Centre now. 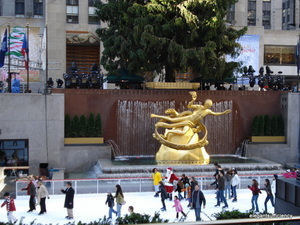 Can you spot some skating with Santa? But there's no-one there. Never mind. Come on, we'll turn east on 42nd St heading for Grand Central Station. 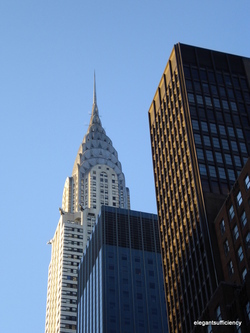 Doesn't the Chrysler building look glorious? After a look in the Station, at a Christmas market and a railway exhibit (take your choice and go with Mark or with Jordi and I, as you prefer), we'll make a short stop in the lobby of the Daily News Building, where there's huge turning globe and some interesting facts in there amongst the Christmas trees. Back out on the street, we'll have another gaze at the Chrysler building and take yet another photograph of it. Because. We. Love. It. Let's walk past Tudor City and listen whilst Jordi tells us what it's like to live in those historically protected apartments. Get an insight into the challenges of living in this part of NYC. Oh my, the sun's starting to go down - it's about 3.45pm and here we are on 1st Ave by the United Nations building. How are your feet? Mine are beginning to complain!! Look, over there in the bushes, there's the elephant Jordi was telling us about. Good job the greenery has grown up to protect his modesty! Next stop, the Japanese Society. Aha! There is it, opposite on 44th St. There's a great exhibition of Serizawa's work there and maybe - please, Lord - there will be somewhere to sit down! Because we're going to Rosa Mexicano for dinner and we need room for Churros, don't we, Jordi? Time to walk off all those calories and enjoy the decorations along 5th again. We'll take photos of Bergdorf Goodman's windows now there are fewer people and the reflections are not so distracting. 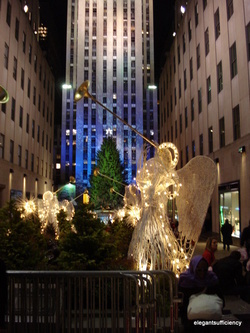 One last walk - our third - past the Rockefeller Centre and I don't know about you, but I'm ready for bed. My feet held up - just - did yours?